As previously set out Swiss agricultual policy, specifically the design of direct support, underwent a major reform in 2014. Agricultural budgets are set for four years so this year the Federal Office for Agriculture (FOAG) proposed the same budget and very minor changes. This was signed off by the Parliament and every group I talked to agreed that stability was important. After the reform there was initially less engagement from farmers than expected. This has picked up. The reason given was the scale of the change and farmers being unclear what their options were. For this reason and the lack of any external drivers the consensus is to keep the current policy until the end of 21. The following are some of the ideas that stakeholders and officials presented to me as possible reforms for direct support. This list can also be used to understand some of the frustrations and failures of the current system. Some are complementary, others opposing but as a set of ideas they indicate that the direction of reform remains towards public good delivery. The current system combines income support with public good delivery. This is clear in both the scale of some of the payments and the fact there are so many. The last reform started with the idea of ‘how can we keep giving farmers lots of money’ and took it from there. The result is a set of instruments that are unwieldy. A number of officials pointed out that it was hard to know whether programmes were being used to access money or because there was a desire to undertake the activities. This lack of clarity makes planning future reforms difficult. One option would be to seperate out a larger income support budget and then provide a set of additional programmes for beneficial activities. The risk here is that with less money attached farmers don’t engage with the public good elements. Currently the farmer is given a choice about what programmes they enter but also how and what they enter into the programme. This has led to some sub-optimal outcomes with farmers often choosing the path of least resistance / what suits their business best. Some officials felt this was not the best use of public money and that there might be a need to be more prescriptive about what features were included and where they had to be sited. 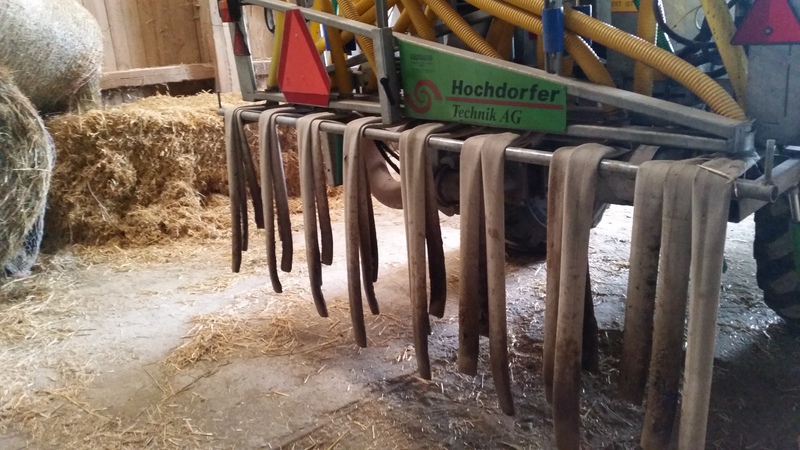 One of the interesting elements of the Swiss system was the gradual shift of activities from support (where farmers are specifically paid for doing something) to PEP (where they are required to do something if they want to access any support). The current resource protection programme, which pays farmers for various elements including using trailing hoses to reduce ammonia pollution, for example, was intended to be merged into PEP but Parliament decided to extend it for a few more years. It’s possible this and other programmes could be subsumed into the Swiss cross-compliance system PEP. Participation rates are high for the biodiversity programme and although there has not yet been a formal evaluation it was recognised that much of this habitat is not very effective for biodiversity. One way to encourage this would be put more money in the higher level of biodiversity payment which is based on results (quality 2). This would encourage better siting of habitats and improve their quality. At an earlier stage of reform farmers could access biodiversity payments across their whole farm. This was stopped by agricultural office, when I asked why they said “some farmers weren’t producing anything”. Stakeholders and officials from an environmental perspective were more open to allowing greater specialisation. Here the tension between the strategic case for supporting farmers (food security) and the tactical argument (public goods) is clear. The constitution relates to ‘multi-functional’ agriculture so it’s not certain that specialisation, at least of public goods, will be supported. The swiss system identifies three main regions – plains, jura (hills) and the alps. Support levels differ in each of these regions. Broadly becoming more generous the higher the altitude. One option that was mentioned was more regional divergence so that the income support needed to keep moutain farmers active is not accessible or at least less generous in the plains. A related reform was allowing for more cantonal flexibility around rules and priorities. In many ways this would make sense in the Swiss system but the number of cantons (26) means that it would become difficult for the Federal agencies to retain control. Some suggested that some of the Federal Councillors (like the UK Cabinet) were interested in reducing the budget. This would neccesitate some hard decisions about what farmers were required to do, and what they could access additional support for. Related to the poor quality and lack of targetting in some programmes, one option was for extension services to visit the farm and develop a management plan that would form the basis of their application for support. This was intended to overcome the skills and capacity gap that many farmers face, especially around biodiversity. The Swiss currently spend quite a lot of extension services, inevitable with many small farms, and there was a view that this could be expanded and re-purposed. The last reform was controversial and one of the ways that farmers were courted was to create additional programmes for mountain farmers. This led to seven programmes, each with various elements and it’s now difficult to manage and understand. Related to other proposals set out here, some suggested removing or merging some of the programmes. Others, maybe removing them entirely or including them in PEP. Officials felt that they could not simply increase the requirements they placed on farmers over time, they were keen to simplify programmes where possible. One idea was the get rid of the complex fertiliser balance calculator (a requirement of PEP) and replace it with a ban on concentrates or for the farmer to demonstrate they have enough grass to feed their herd. Simplier, if not necessarily less demanding.